With a stay at Blue Water Resort in Myrtle Beach (South Myrtle Beach), you'll be within a 5-minute drive of Family Kingdom Amusement Park and Myrtle Beach Boardwalk. This condo is 2.4 mi (3.8 km) from SkyWheel Myrtle Beach and 2.8 mi (4.5 km) from The Market Common. Make yourself at home in one of the 107 air-conditioned rooms featuring kitchenettes with refrigerators and microwaves. Rooms have private balconies. Complimentary wireless Internet access keeps you connected, and cable programming is available for your entertainment. Conveniences include safes and coffee/tea makers, and housekeeping is provided daily. Dip into one of the 5 outdoor swimming pools or enjoy other recreational amenities including an indoor tennis court and a sauna. Additional features at this condo include complimentary wireless Internet access, an arcade/game room, and a picnic area. Enjoy a meal at the restaurant or snacks in the condo's coffee shop/café. Wrap up your day with a drink at the bar/lounge. 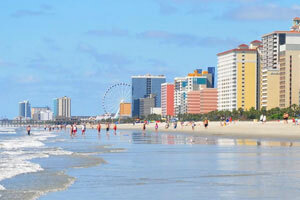 The preferred airport for Blue Water Resort is Myrtle Beach, SC (MYR).